Цена: 900 лв. Цена: 799 лв. 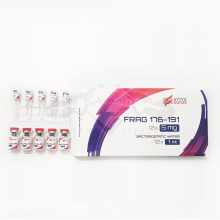 Frag 176-191 is a modified amino acid sequence of growth hormone. The lipolytic activity of Frag 176-191 was confirmed by several published studies. The compound acts directly on the adipose fat tissues, increasing lipolysis and decreasing lipogenesis. Цена: 550 лв. Цена: 449 лв. Цена: 800 лв. Цена: 599 лв. Ipamorelin, also called as NNC 26-0161, is a pentapeptide, Ghrelin receptor agonist, and selective secretagogue of growth hormones. Цена: 600 лв. Цена: 549 лв. Цена: 680 лв. Цена: 549 лв. IGF1-DES (Insulin Growth Factor – 1 DES) is a human recombinant analogue of somatomedin- C with insulin-like properties. IGF1-DES contains 67 amino acids chain that mimics insulin structure. CJC-1295 (DAC) belongs to tetra-substituted peptide hormones classification. CJC-1295 (DAC) contains 30 amino acids. The modified version of GRF 1-29 demonstrates a high affinity towards GHRH receptors.